Sitting behind your desk at work for hours on end can be an extremely laborious task. As you feel your body start to ache and your concentration begin to dwindle, it may be worth taking a few minutes out of your day to simply close your eyes, breathe and put your body through a few subtle movements that will make you feel surprisingly invigorated. Shona Vertue, former personal trainer for David Beckham and founder of the Vertue Method, has devised an eight-step sequence of what she describes as “desk yoga”. Buti Yoga: What is it, what are the benefits and where can you try it? The aim of desk yoga, as Vertue explains on her blog, is to rid your desk-bound body of its familiar aches and pains, all the while boosting your brain power and enhancing your ability to focus. According to Vertue, several studies have shown that the human brain reaches a “break zone” after 45 minutes of work, meaning that you’re only able to remain fully focused for 45-minute intervals. 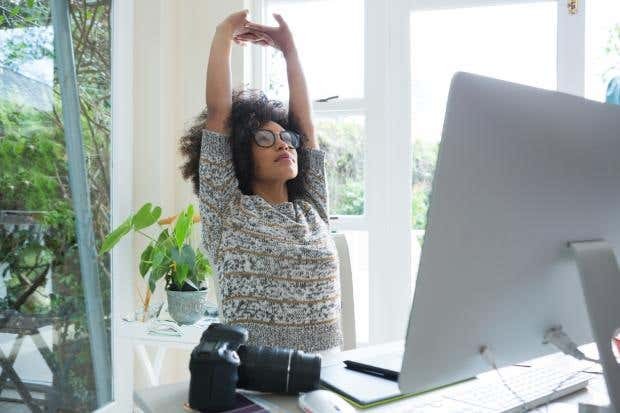 With this in mind, she recommends practising desk yoga every 45 minutes to reconnect with your body and energise your mind. While she acknowledges that doing actual exercise such as hitting the gym or going for a leisurely walk can do wonders for your wellbeing, not everyone has the luxury of time to spare. That’s why this quick and easy desk yoga sequence could prove an extremely beneficial addition to your daily routine in the long run. First, Vertue says to close your eyes and breathe in deep three times, taking three seconds to inhale and then three seconds to exhale. “The breath is very closely linked to the state of your nervous system, so keeping a calm and rhythmic breath can help to relax your body while awakening the mind,” she said. While your eyes are closed, turn your head to the left. At the same time, lift your chest up and feel your right shoulder pulling away from your body. Repeat this process on the right hand side. Next, lock your fingers and place your hands behind your head. As you’re doing this, lift the centre of your chest upwards, making sure to not let your head drop too far backwards. Take your right hand and place it on the outside of your left thigh, which gives your body a nice rotating stretch. Once you’re in this position, raise your left arm and turn your head to face the left, before leaning your body to the right. Repeat this process on the left hand side. The fifth part of the sequence involves doing a simple seated twist on both sides. It’s important to ensure that you keep your chest lifted while doing your seated twists. Gear up for the homestretch.